New Delhi: Delhi Capitals defeated Kolkata Knight Riders by Three runs in the super over in an IPL match at the Feroz Shah Kotla on Saturday. 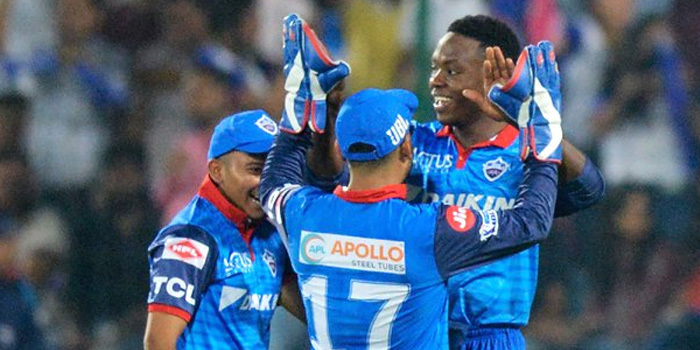 While chasing 186 runs to win, Delhi Capitals got off to good start as Shikhar Dhawan and Prithvi Shaw added 27 runs for the first wicket in 16 balls. Dhawan was dismissed for 16 off 8 balls by Piyush Chawla. Later, Shaw and Delhi skipper Shreyas Iyer shared a 89-run partnership. However, Iyer was dismissed for 43 (off 32 balls) by Andre Russell. Shaw missed his maiden IPL century by a run as he was dismissed for 99. Delhi’s middle-order batsmen failed to take the home side beyond the victory line as DC finished on 185/6 in 20 overs. The match was decided through a super over where DC scored 10/1. Delhi made 10 runs in the super over. In Krishna’s over Delhi skipper struck a four and soon on the next he was dismissed. Rishabh Pant couldn’t play a big shot and Delhi ended up scoring 10 runs for one wicket. In reply, Kagiso Rabada bowled superbly and restricted Knight riders to 7/1. Earlier, Andre Russell (62 runs off 28 balls) and Kolkata knight Riders skipper Dinesh Karthik (50 runs of 36 balls) helped Knight riders to post 185/8. Put in to bat, the visitors got off to a slow start and kept losing wickets on regular intervals and reduced to 61/5 in 9.1 overs. Kolkata’s 5 wickets fell on a score of 61 runs, but Russell and Kartik batted brilliantly and completed their half-century. Russell continued his superb form in the tournament, scored 62 runs off 28 balls with the help of 4 fours and six sixes, while Karthik hit five fours and two sixes and made 50 runs off 36 balls. The pair of Karthik and Russell shared a 95 runs partnership for the 6th wicket and pulled out the team from the tough situation. Openers Chris Lynn scored 20 runs off 18 balls, while Robin Uthappa scored 11 runs. Piyush Chawla scored 12 runs off five balls with the help of one four and a six. Kuldeep Yadav scored an unbeaten 10. Kolkata’s somehow scored 100 runs in 13.5 overs but with help of Russell the visitors scored 85 runs in the last 6.1 overs.